Pain Relief – Hot or Cold? Self Help Pain Relief: Apply Hot or Cold? A frequent question I get asked shall I use a hot or cold compress? Firstly, let’s understand what each does? You can use either dry heat (heat pad) or moist heat (hot baths, steam), both should aim or a ‘warm’ temperature not hot! A common mistake people make, which leads to burns! You can use local treatment for targeting one muscle, or a whole area targeting whole body stiffness. When you should not use heat? You can use for local areas: ice packs, sprays, or whole body effect: ice baths, ice massage. During the first 72 hours of initial injury, can use ice three times a day for 10-15 minutes. When should you not use ice? As a general rule of thumb use cold therapy on a new injury. The first object is to reduce the inflammation, which is the body’s first response to injury. (Remember inflammation is a big source of pain). It should be applied for up to 15 minutes only and usually no more than 4 times a day. If you are experiencing muscle spasm, then heat can be a great source of relief. Heat is generally best applied a few days after the acute injury has passed (ie giving time for the inflammation to subside). As a general rule of thumb, if you feel like you need a massage, it probably means you are ready for a heat pack. If you are unsure, always go for cold therapy first, as at the worst it will do you no harm. Where as applying heat to an inflamed area will increase the inflammation which will certainly add to the pain and stop you feeling better. Also remember that generally speaking heat therapy works against medicines like Neurofen (ibuprofen), naproxyn, diclofenac etc. 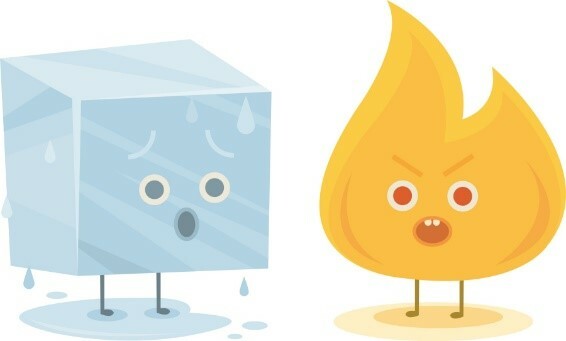 Always protect your body from direct sources of hot or cold as both can burn the skin, as mentioned above. If this all sounds confusing or need personal advice – give us a call – we are always on hand to give free telephone advice – even if you are not a patient. So please share this blog or visit our pain relief page!